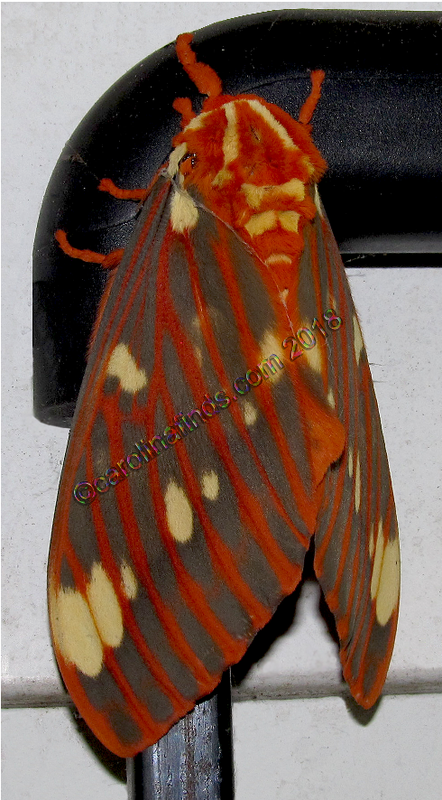 We found this large, beautiful moth hanging out under our carport this morning. It’s a Regal or Royal walnut moth, citheronia regalis. 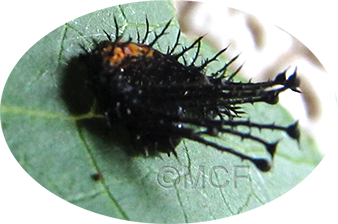 In Larva stage it is known as a hickory horned devil. I wish I could have gotten a picture with his wings expanded. a plastic bag below her – once she is done I will have to find a safe place for them. These moths are amazing. They emerge one night, mate 24 hours later then lay their eggs 24 hours after that. Sadly, these moths are short-lived – possibly a week of life. From the information I’ve read, they do not eat – they don’t have mouths. Her head is covered with what looks more like feathers. I couldn’t help myself – I had to carefully touch her – she feels like silk. I was concerned I’d cause her to fly away but she didn’t she seemed to only slightly tense. Hopefully her eggs will hatch and I will be fortunate enough to see one of her caterpillars. Some info says they are huge – and can reach up to six inches long. UPDATE 8-19-2018: Several days ago eggs began to hatch. These are some tiny creatures – My camera isn’t very good but I did manage to get this photo – the larger spikes are on it’s head. Not all the eggs hatched and some didn’t make it, sadly. Since these eggs were laid nowhere close to anything edible for them, I’ve been picking fresh pecan leaves several times a day to feed them. Hopefully the remaining babies will survive. SAD UPDATE: The babies disappeared, one by one, until there was only one left. The last one was doing well but unfortunately became spider food. I’m guessing that is what happened to the others as well. Nature can be cruel.